This species is accepted, and its native range is Indo-China to Malaya. Myanmar, Thailand and Vietnam , southwards to Cambodia, Peninsular Malaysia (type) and Singapore. Evergreen herb to 0.8 m tall. Subterranean stem a rhizome, to 20 × 3–6 cm, light brown outside, purplish brown inside. 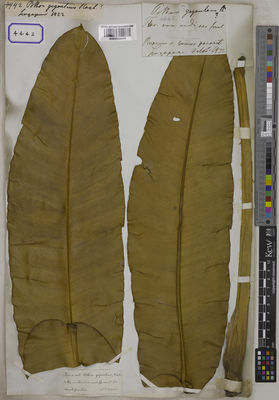 Cataphylls separately sheathing petiole and peduncle, 10–20 cm long, brown; petiole to 70 × 0.8–2 cm wide, green and brown mottled; leaf blade trifoliolate; leaflets elliptic-ovate, to 30 cm long, margins entire and sometimes undulate, apex acuminate, ending in an arista 1 cm long, base convex, with a petiolule 1–5 cm long, plain glossy green, sometimes marked with creamy blotches and veins above, underside glaucous green. Inflorescence held well below the foliage; peduncle 18–25 cm long × 6–8 mm across, green and red mottled; spathe tube funnel-shaped, ca 6 × 1.5 cm at the base, widening to 2.5 cm near the mouth, pale green, white at the base; spathe mouth margins recurved, to 1 cm wide; spathe limb ovate-oblong, ca 7 × 3 cm, glossy dark green, ending in an acuminate–filiform tip to 1 cm long; spadix appendix hardly exserted from the tube, to 3.5 cm long × 2–3 mm wide, sessile, covered with filiform bristles from base to apex, these ca 1 cm long, red-brown or green; fertile zone staminate or bisexual, 3–4 cm long × ca 8 mm wide; staminate flowers 2–4-androus; anthers carmine, stalked, 1 mm long; thecae dehiscent by an oblong pore; pistillate flowers densely arranged; oblong-ovoid and flattened on top; stigma short-styled, white, penicillate. Infructescence on an erect peduncle, cylindrical, to 6.5 × 3 cm; fruits red when ripe, prismatic, ca 1.2 cm wide, somewhat lobed, flattened and depressed on top, up to 2 seeds per berry. Seeds globose, 5–6 mm diam. Lowland damp forest, ridge vegetation, often established in oil palm plantations, on a variety of substrates including iron–rich alluvium.